Storytelling is of course a form of communication. And what is that? In most cases our communication is limited to something we could describe as information only. Messages in one direction describing somthing that has happened or will happen. But Storytelling and communication can be so much more. Storytelling is a process and it aims higher than just spreading information. Loord Design has developed two different models describing this. One Process Model dealing with how we look on development processes and one Storytelling/Communication Model to describe the base aspects of storytelling. Our Process model is called TRIAL and our communication model is called ITRIM. 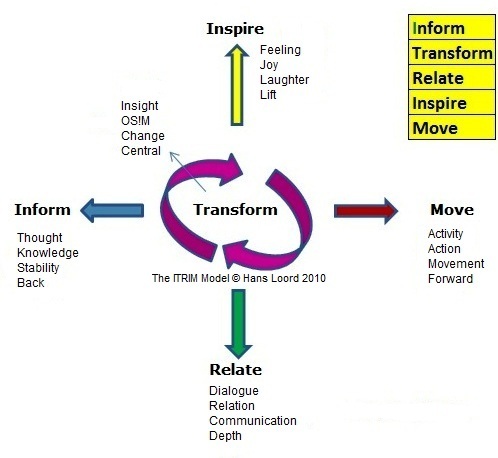 Loord Design has developed a special five-step communication model called ITRIM. It consists of Information, Transformation, Relation, Inspiration and Movement. Communication often both starts and finishes with Information, Information on web pages, press releases and alike, but Loord Design looks upon Communication from a wider perspective. For us is Information only a small portion of what Communication is all about. But that portion is also important. Loord Design means that good communicsation should generate transformation. With transformation we mean that our communication creates change in how we think, feel and creates new attitudes to ourselves and to our company. These changes contribute to a greater understanding and to new knowledge. But Communication is also about creating and maintaining relations. There have to be dialogue and depth for a real relation to be created. Loord Design will help you with your relation work. To make Communication work optimally it should also inspire us, motivate us and give us positive energy forwards and upwads. Loord Design helps you to create inspiration, motivation and creative content. Kommunikation får sitt största värde när den leder till nya energigivande handlingar. När kommunikationen också leder till rörelse framåt och till utveckling. Loord Design hjälper er med handlingsorienterad kommunikation. Med ITRIM – som även kan läsas ”I Trim” – får du eller ditt företag chans att utveckla den typ av kommunikationslösning som passar i er situation och för er. Loord Design är här för att skräddarsy er kommunikation – Välkommen!